After over a decade in the construction business, Martin Readman and Annie Jomphe did what every overworked couple dreams of doing: They sold all their possessions, bought a boat and sailed around the Caribbean for two years. When duty called, they returned to work, but they were galvanized to turn their sea adventures into a more permanent way of life. “We were inspired by boat life and its efficiency,” says Jomphe, the co-founder of Sitka Concept, a company that restores vintage Airstreams. So she and her husband set out to turn an iconic but decaying American travel trailer into their new permanent home. “We had to think about every inch of space so it would be efficient, organized and easy to access,” she says. “So when we, a family of five, moved into an Airstream, everything had its dedicated place.” At the same time, they wanted their trailer “Peanut” (a 1976 Airstream Land Yacht) to be “spacy and airy,” so they didn’t overload it with shelves. 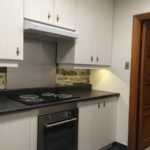 The restoration was impressive: Their 200-square-foot, self-sufficient house/trailer features three bunk beds, a private bedroom, a full bathroom with tiled shower, a washer/dryer, office space, and a kitchen (with good-sized appliances and a wood stove). It’s certainly homey: For the shelving and walls, they used a mostly raw and natural materials, including walnut, cedar and pine wood. 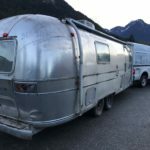 While the living experiment only lasted six months — blame frigid Canadian winters — it inspired the couple to offer the Airstream restoration service to the general public. The process is pretty simple. 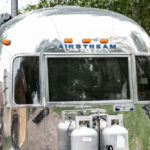 You can use your own Airstream, or they can source one for you. And you don’t have to turn the trailer into a home — Sitka will turn it into whatever you want, be it a food truck, an office or an art studio (may we suggest a mobile bar?). The restoration will take about three months, and they can arrange to transport the finished project anywhere in the U.S. or Canada. In other words: The Airstream of your dreams awaits.